PHUKET: The renowned Soi Dog Foundation has announced the passing of one of its long-term animal welfare campaigners, Yvonne de Haay Stekelenburg. “Soi Dog Foundation is sad to announce the death of Yvonne de Haay Stekelenburg last week,” said a statement issued to The Phuket News today (June 20). “Yvonne was one of the first foreigners to take an interest in Phuket’s stray dogs, and for many years up to her death would be found feeding and taking dogs to Phuket Animal Hospital, and in more recent years Soi Dog Foundation. “Yvonne worked as holiday rep and was based in Patong, but all her spare time was devoted to helping the stray dogs. 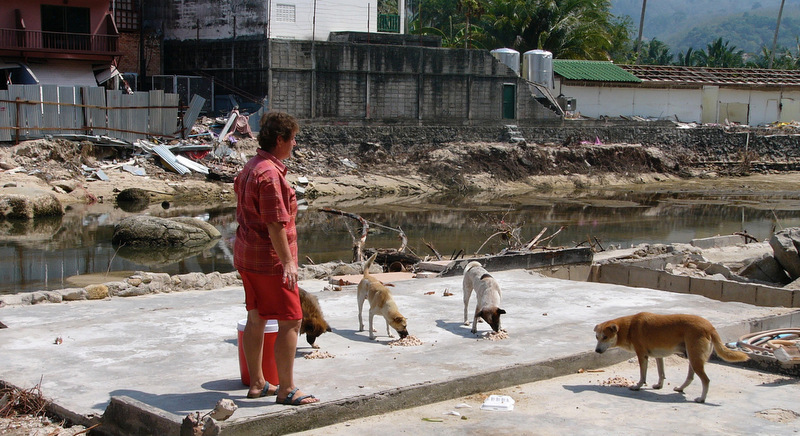 She fed dogs throughout Patong and also in areas around Katu where she lived. “Yvonne had been battling cancer for some time. The dogs of Patong will miss her dearly,” the statement said. Funeral services funeral will be held the Laem Petch temple on the Patong beach road (see map below) on Wednesday (June 21), starting at noon.